GrocerKey (http://www.grocerkey.com), an omni-commerce software and operations leader, today announced the expansion of its omni-commerce platform to include mobile self-checkout. The new functionality expands the company’s current mobile platform to allow shoppers to further leverage their smartphone, improving the shopping experience with “scan and go” functionality. 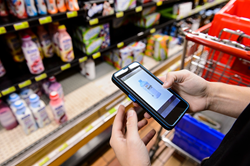 In the race to compete with Amazon, Walmart, and Kroger’s new “Scan, Bag, and Go” offer, GrocerKey’s new mobile self-checkout functionality enables regional and independent grocers to offer their shoppers a frictionless in-store experience. Fully integrated to their end-to-end omni-commerce platform, GrocerKey shoppers can build lists, scan items to cart, and complete the transaction with app-based payment options. With GrocerKey’s white-labeled omni-commerce and mobile platform, grocers control the shopper and brand experience. GrocerKey’s Mobile Self-Checkout solution presents pricing, promotion, and nutritional information with premium options that enable turn-by-turn navigation as they shop. Cart auditing is configurable, as are the options for bagging and lane designation for completing the in-store experience. Founded in 2014 and based in Madison, Wisconsin, GrocerKey is a fast-growing software company that helps brick & mortar retailers adapt to the new digital and mobile world. The company offers a retailer-branded omni-commerce and mobile shopping solution for retailers of all sizes. Offered on a highly scalable software-as-a-service platform, GrocerKey’s solution helps brick & mortar retailers become successful omni-commerce retailers. The GrocerKey solution includes an omni-commerce platform designed to integrate with a retailer’s existing merchandising, loyalty, and point-of-sale technologies. It also includes online and mobile shopping, store-based picking, and delivery management capabilities. For more information, please visit http://www.grocerkey.com.